Description of decorations: Volcanic stone andesite, river substrate. Description of equipment: JBL CristalProfi e1501 GREENLINE, Propeller Pump 4000L/h, Lamps: 2x Led Spotlight 10W, 5000K. Water parameters: Temperature is 25°C, PH is 8,5 GH is 8. 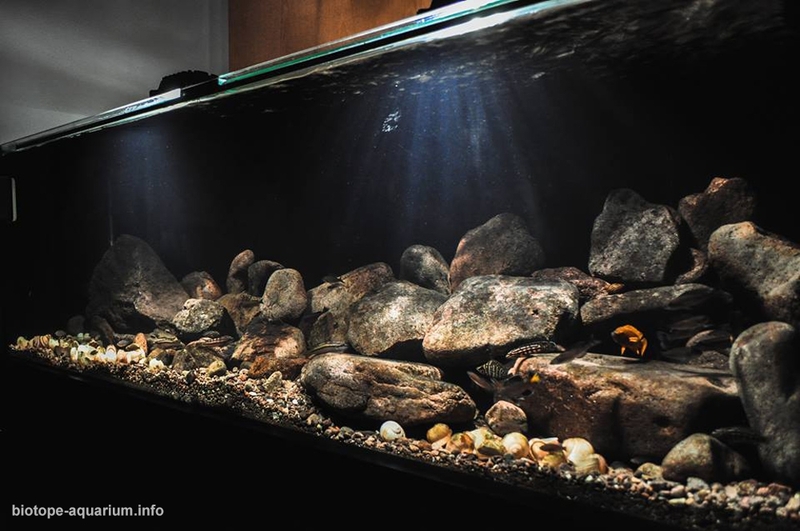 Description of the area surrounding the biotope: Lake Tanganyika is an African Great Lake. It is the second oldest freshwater lake in the world, the second largest by volume, and the second deepest. It is the world’s longest lake.The lake is divided among four countries – Tanzania, Democratic Republic of the Congo, Burundi, and Zambia, with Tanzania (46%) and Congo (40%) possessing the majority of the lake. The water flows into the Congo River system and ultimately into the Atlantic Ocean. 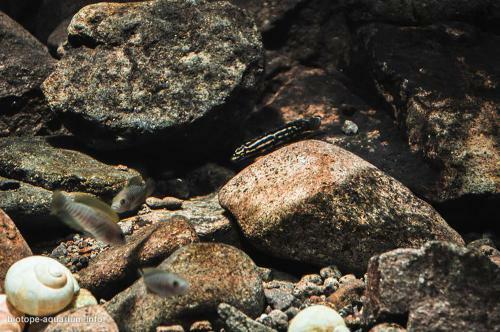 Description of the underwater landscape of the biotope: The lake holds at least 250 species of cichlid fish.Almost all (98%) of the Tanganyika cichlids are endemic to the lake and it is thus an important biological resource for the study of speciation in evolution.Most Tanganyika cichlids live along the shoreline down to a depth of 100 m, but some deep-water species regularly descend to 200 m.Tanganyika cichlids differ extensively in ecology and include species that are herbivores, detritivores, planktivores, insectivores, molluscivores, scavengers, scale-eaters and piscivores. Their breeding behavior fall into two main groups, the substrate spawners (often in caves or rock crevices) and the mouthbrooders. 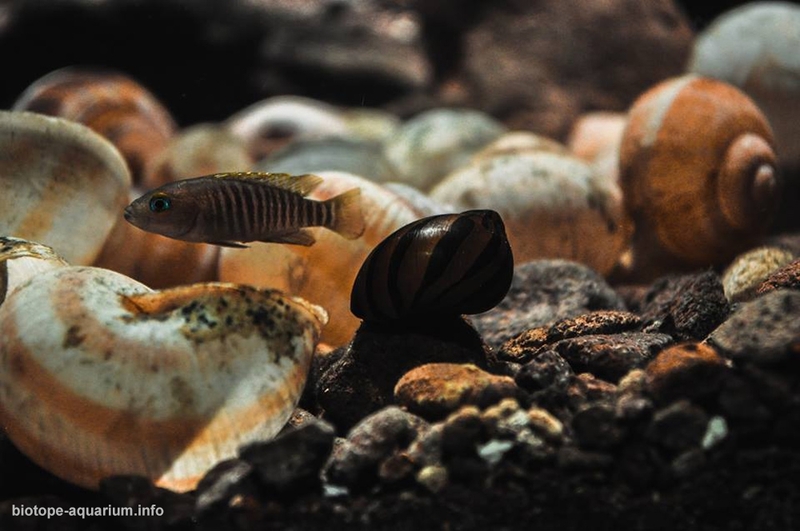 Among the endemic species are two of the world’s smallest cichlids, Neolamprologus multifasciatus and N. similis (both shell dwellers). 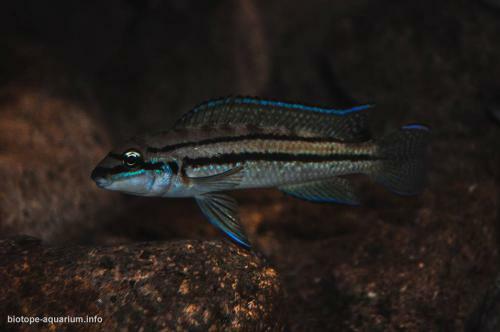 Many cichlids from Lake Tanganyika, are popular aquarium fish due to their bright colors and patterns, and interesting behaviors. Description of the parameters of the habitat: The pH, KH (carbonate hardness), and GH (general hardness) varies from area to area. Take, for example, Cape Mpimbwe. That area of Tanzania has a fluctuating pH range from 8.5 to about 9.3 depending on several factors: Season (time of year), Rainfall, Depth sample taken, Time of day …and other factors as well. The pH alone is a dynamic feature… In general, an aquarium with a pH of 8.5 and hardness measuring in range of “moderate” will provide your Tanganyikan cichlids with all the right properties for success. Tanganyika Lake water parameters are approximately: PH: 8.5-9.4, GH: 12-18, Kh: 12-16. 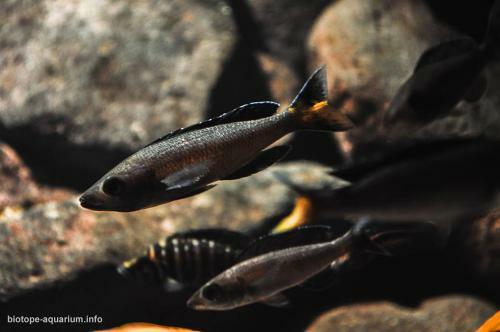 List of fishes and invertebrates occurring in the nature biotope: Fish: Julidochromis dickfeldi, Julidochromis marlieri, Lamprologus signatus, Neolamprologus tretocephalus, Paracyprichromis nigripinnis, Spathodus, Synodontis multipunctatus, Telmatochromis vittatus, Julidochromis ornatus, Tropheus kiriza, Tropheus duboisi, Cyphotilapia frontosa, Xenotilapia flavipinnis, Enantiopus kilesa, Callochromis macrops Ndole Red, Altolamprologus compresiceps Goldhed Kasanga, Cyprichromis leptosoma Mpulungu, Eretmodus cyanostictus, Lamprologus brevis Congo, Lepidiolamprologus Nkambae, Xenotilapia ornatipinnis, Ophthalmotilapia Nasuta Tiger, Neolamprologus cylindricus, Chalinochromis brichardi. Snail: Neothauma tanganyicense. List of plants found in the nature biotope: Ceratophyllum, Vallisneria, Potamogeton, Limnotilapia Dardennii, Tylochromis Polylepis and Oreochronis Tanganicae. Threats to the ecology: Lake Tanganyika is outstanding among lakes because of the intrinsic value of its fauna and the significance of its natural resources. Reconciliation of resource exploitation and conservation is essential because of changes in the lake environment caused by human activities. Important new initiatives to shape national environmental policies for the lake are taking place. Regional cooperation is required for major lakewide studies, especially in lake circulation and the prevention of pollution, and in adjustment of fisheries objectives to meet conservation as well as economic goals. Basic conservation aims proposed are (1) avoidance of gross changes in natural communities in the lake in general, and (2) retention of the fauna in some parts in an unexploited state, as in underwater parks. Early strategies suggested are the extension of four existing wildlife land parks further into the lake to form underwater parks, and reconnaissance of other potential park sites. Initial ecological and social surveys conducted from the four parks would provide baseline data for management. Underwater park boundaries should as far as possible be determined on an ecological basis to encompass entire local distributions of species populations. A case of alternative boundaries is examined for the Nsumbu Park. Other important planning considerations are the multi‐use of parks in addition to fundamental conservation, such as tourism, sport fishing, and specific traditional lake and land uses. Regional cooperation between parks will be important for tourism.